Congratulations on the new gig with Netflix! This makes perfect sense. As new producers of original programming, there is no better way to fulfill your mission of promoting greater empathy and understanding between peoples than to join forces with what has become one of the world’s great entertainment platforms. We all know that story telling is the most traditional method of engaging each other, and documentaries can tell true stories with universal appeal. Netflix has grown to the point where it can make video story telling possible on a global scale like never before. Our team has set out on an audacious journey to create a women’s counterpart to the largest annual sports event in the world, The Tour de France. But our event will be much more than just a cycling race. Our mission is to solve the world’s greatest problem by engaging in the world’s most universal activity using the world’s greatest example. The problem: global gender inequality; the activity: cycling; and the example? America! Why is gender inequality the world’s greatest problem? Very simply, it is because we can’t possibly solve all the other problems that the world faces unless we fully unleash the brilliance and energy of all of the world’s brainpower, meaning that we must include the entire half of humanity that is so often dis-empowered or oppressed. Until we do that, we will always have m ore problems than we should. 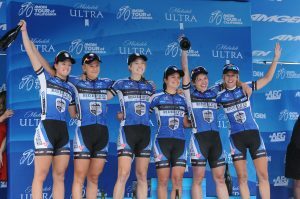 We will tell this story with a high profile multi-stage elite women’s cycling race that will draw some of the greatest cyclists from around the world. To every young girl, teenager and woman who questions their potential, we will show them what it means to be committed, competitive and empowered, to stand on a podium, to triumph, and to be celebrated. It is a great story and one that we are just starting to write. And this is where we need your help. Tour of America; Road to Glory, our Netflix concept, proposes a multi-part documentary that scours the world for real life stories of young women and girls who are meeting their challenges through empowerment, some of them involving their first-ever experience of real mobility. Whether by bicycle or, in the case of Saudi Arabia, by finally being given the right to drive a car, mobility is an empowering experience – it expands horizons, intellectually, emotionally and of course, literally. These vignettes will be interspersed with a parallel real-life narrative that will track the building of this race by our small team as we meet with sponsors, engage athletes, plan the route, overcome obstacles and countdown to the first-ever Tour of America. It will be original entertainment content with a story that culminates in the race itself – a live 5-day event that will be broadcast by Netflix’s designated live broadcast partner and made available for new, prospective and existing Netflix subscribers. Road to Glory and the Tour of America would give Netflix something it’s never had before: ownership in a sports property franchise that generates content and can be used every year to drive new subscriptions around the world for an incremental target segment: international sports fans. This doesn’t mean they have to broadcast the race (we know they aren’t into that), but as part owners, they’d have complete or joint control over all of the content after the race happens. That’s a lot of story telling! The Season 1 download of Road to Glory will tell the full story of the first Tour of America with its usual non-linear buzz attached, and most importantly, it will widen the social platform and universal call to action that makes it all worthwhile: It is in all of our interests to end gender discrimination and oppression around the world and empower young girls and women to raise us all up. And in addition to being a wellspring of empathy generation in the spirit of the Olympic Games, it’s also going to be one of the world’s next great sports event – a perfect unifying showcase for America – what we are when we are at our best, and what we aspire to be when we are not. There is, of course, so much more to Road to Glory than we can fit into a blog post. So, tell us when and where we can make our formal pitch to you. Mr. and Mrs. Obama, we are ready, and so is the world. We hope you’ll Join the Journey!